With the magic of print-on-demand, you can order the book with overnight shipping (Amazon Prime! ), and be reading full-color insights tomorrow. Yowza. The best part? There’s no garish marketing fluff needed by traditional books that compete for shelf space (testimonials, callouts, those can go in the Amazon description!). 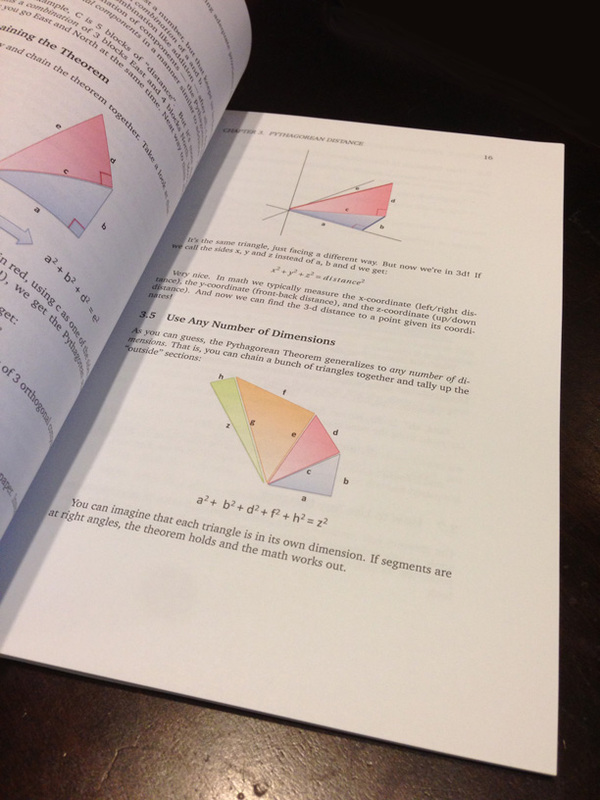 The book is my take on a simple, friendly presentation of the math essentials. It’s what I wish I had in high school (and college, and afterwards), and a tremendous value for the time and frustration it will save you. Unlike a textbook you’re afraid to open, this book is meant to be accessible. Years later, flip back to that diagram that helped imaginary numbers click. 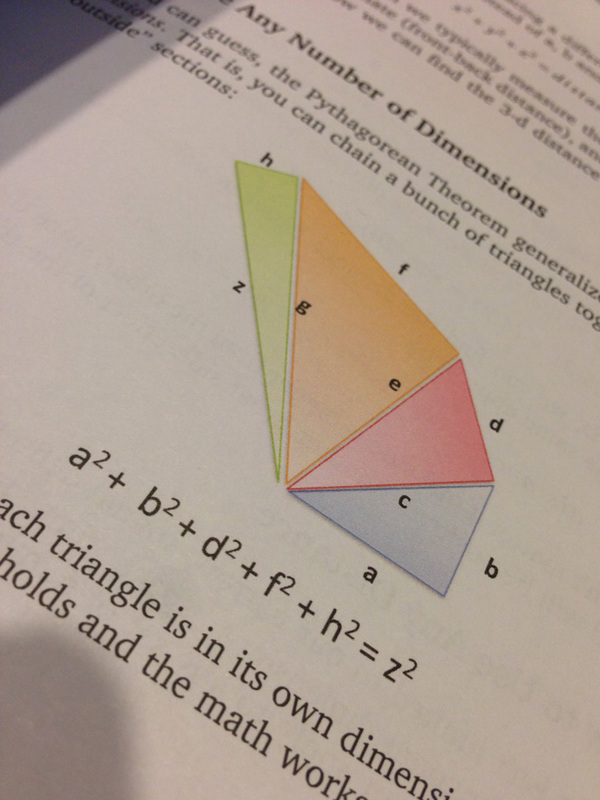 Show that curious young student how the Pythagorean theorem goes way beyond triangles. Math is meant to be seen and felt, not just thought about. The full-color format does increase the printing costs, but I wanted to share the highest-quality version I could (hey, I’m a reader too!). The introductory price (under \$20) is heavily discounted and will change soon, so grab your copy today! PS: Reviews are sincerely appreciated, and if you’re a math reviewer (or willing to be one! ), contact me and I’ll get a copy your way. Thanks for your support! If you are a parent, a student, or a formal teacher you must buy this book. Really…you must. The textbooks and websites will come and go but if introduced to your high school student early it will open up a whole new world that only those with the most insightful of teachers are ever exposed. I got mine! Actually, I just ordered mine. Looking forward to reading it.. This is an excellent book. Actually for a deep understanding of the topics presented it is quite exceptional. I purchased this for my 12 year old son (math enthusiast) as I wished I had access to this when I was at school. A great feature of the book and website is discussion on how concepts (e.g. negative numbers, imaginary numbers etc.) emerged in history. In many cases this is a powerful approach to begin to reveal the intuition and one which I incorporate in my (medical and science) teaching. Well done and thank you Kalid. @Matthew: Really appreciate the thoughtful comments. My goal was to share the book I wish I could have read when entering high school / college, really happy that resonated with you! Exactly, we often have to look at the history of an idea to figure out why it’s so useful. Teaching it in a vacuum, without any context, is not a great way to get a deep understanding. Appreciate the note! Is there anyway I could obtain the table of contents of the book? 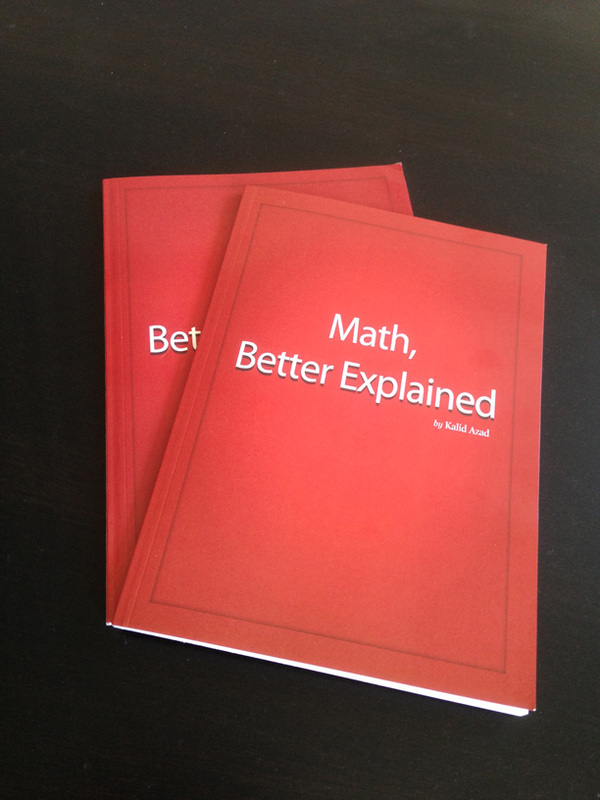 I am interested in reading your book “Math Better Explained” and would be willing to supply you with feedback and support through sales to my private students. Perhaps you might consider forwarding me a paperback copy? Thanks Gordon, I’ve just emailed you. @dip ranjan chatterjee: Thanks, I’ll reach out to you! Eagerly awaiting an iBooks version! Thanks! Hope to have the iBooks version out by the holidays :). If I could obtain the “Introduction To Calculus” chapter of the book in PDF version in free, it would be much pleasure for me. Hi Ratul, I don’t have a PDF, but you can check out the online article here: http://betterexplained.com/articles/a-gentle-introduction-to-learning-calculus/ – hope that helps! Forward me a paperback copy if you may. I really really need that. The book is not available in middle east.